It’s a major mountain for Tiger Woods to climb. Yet the former world number one has not entirely ruled out contesting the FedEx Cup playoffs, even though he is languishing in 185th spot with seemingly little chance – at the moment. Should his game “click” this week at the US PGA Championship, the final major of the year, to be played at Whistling Straits in Wisconsin, then Tiger’s goals for the year may change dramatically. For a start, if Woods was to finish near the top of the field at the PGA he may suddenly get the urge to play in the Wyndham Championship the week after the PGA. That’s the final regular PGA Tour event for players to get into the top 125 and qualify for the FedEx Cup playoffs. 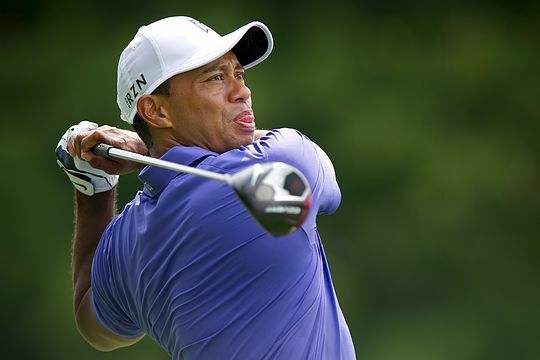 His recent tie for 18th at the Quicken Loans National saw Tiger “surge” to No 185, up 12 spots for the FedEx playoffs. “’Just win. It’s not that complicated,” said Woods when discussing his playoff prospects. And if Woods does confound his critics and win the USPGA, his 15th major championship, it would elevate him into the top 60 for the FedEx. But that may be stretching things, given that Woods hasn’t won a major for seven years and has even gone winless on the USPGA Tour for almost two years as well. “A lot of it is dependent on what I do with the PGA and whether or not I have a chance to make the playoffs,” Woods said.